The US presidential elections of November 2016 have shaken the enduring myth of American exceptionalism. For many international observers, the surprise and shock of Donald Trump's electoral victory and the ascendancy of populist politics have occasioned a strong sense of political déjà-vu. The Trump victory seems to fit well into a wider global series. India, Turkey, Indonesia, Thailand, the Philippines, China under Xi Jinping, Russia under Putin, Egypt under Sisi: the populist style of politics is clearly the new commonsense in much of our world. This international workshop explores the causes and the democratic consequences of this contemporary populist zeitgeist (Mudde 2004). 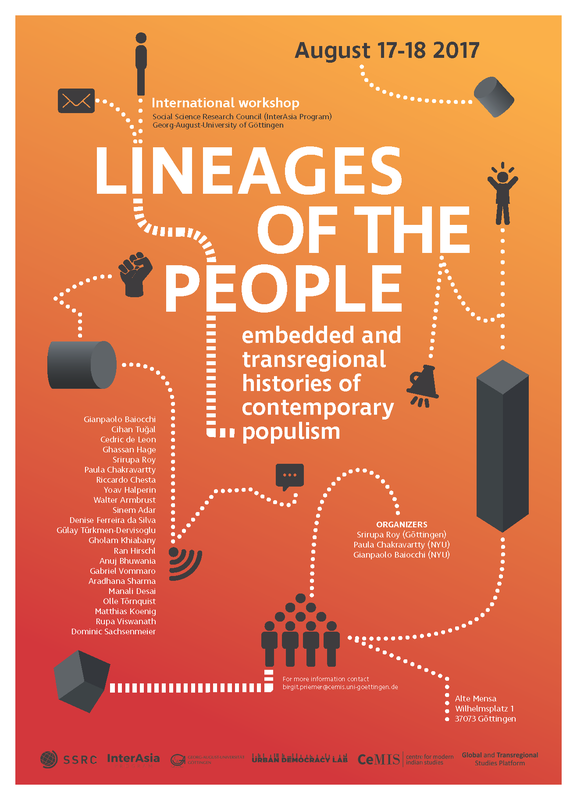 We are specifically interested in developing embedded histories of populist politics that go beyond the "shock and exception" mode of analysis to examine how contemporary populisms build on, refract, and contest earlier projects of people-making and other, non-populist notions of the people. What is the relationship between racial, ethnic, religious, and class-based projects of boundary-making, and the populist politics of "frontier-making" (Laclau 2006)? What are the social, political, and cultural repertoires that the populist "moral monopoly claim" of being the only representative of the "true people" (Müller 2016) draws upon? How do contemporary ideas of the people-versus-elites divide resonate with earlier, equally Manichean binaries of the war on terror, Cold War, or colonialism? Did the phenomena of technocratic politics, judicialized politics and other forms of non-electoral politics pave the way for the contemporary rise of populist outsiders? How have the legacies of economic reform that unfolded across much of the global South in the 1990s shaped the populist imaginaries of political reform in these regions two decades later? What exactly is the relationship between "truth" and "post-truth" - what are the political and institutional continuities between "fake news" and the media logics and news values of commercial, mainstream media? We will address these questions from a transregional perspective that widens the usual Euro-American terrain of populism scholarship to include Asia and the Middle East. The point is not to update the Fukuyama thesis of global convergence by asserting that all political roads must lead to populism and that a universal, one-size-fits-all theory of populism is at hand. Nor is it to reverse modernization teleology and assert that America's present is India's (or Turkey's) past; that the answer to the question of "why Trump?" can be found in Modi's or Erdogan's rise. Instead, the relocation of the populism debate outside Europe and America can bring us to formulate the question of populist politics in new ways, and move us from choice-centric and electoralist discussions of the "populist vote" to a consideration of the organizational contexts, quotidian rhythms, and historical pathways that shape populist political agency.